Based on a AquaConSoil 2017 platform presentation by Richard Bewley (AECOM) titled: “Treatment train strategies at operations sites: Incorporation of oxidative or reductive bio-stimulation following physical removal of contamination”. A risk management strategy was required for an industrial manufacturing facility, as a result of chlorinated solvents having been found in the soil and shallow groundwater underneath a former degreaser and Above Ground Storage Tanks (ASTs). TCE and cis-1,2-DCE accounted for ~90% of the total Chlorinated Hydrocarbons (CHCs). 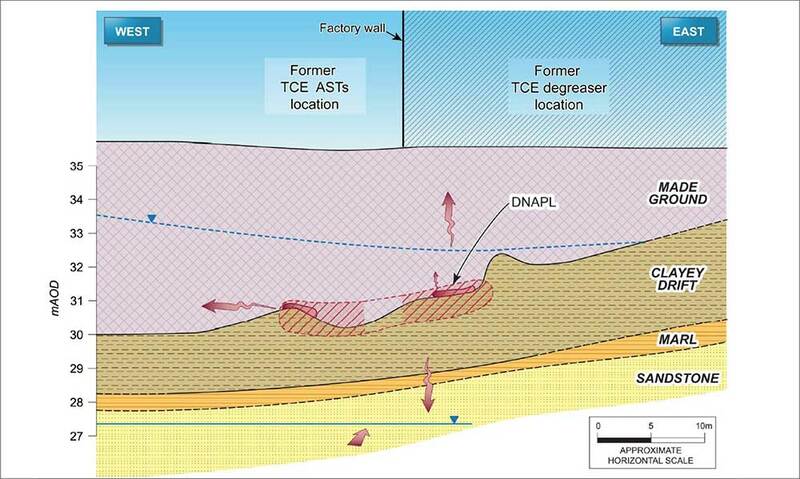 The remedial objective was to mitigate risk to ground- water in the shallow drift and the underlying Sandstone Principal Aquifer. AECOM provided a phased treatment train solution including a dual phase ex- traction system (DPE) to effect mass removal of TCE and breakdown products, resulting in recovery of 1250kg over three to four years. 97% of this mass came from soil vapour and 3% from shallow groundwater. The DPE system reduced contaminant levels in unsaturated soils and substantially decreased the lateral extent of contamination in the saturated zone. 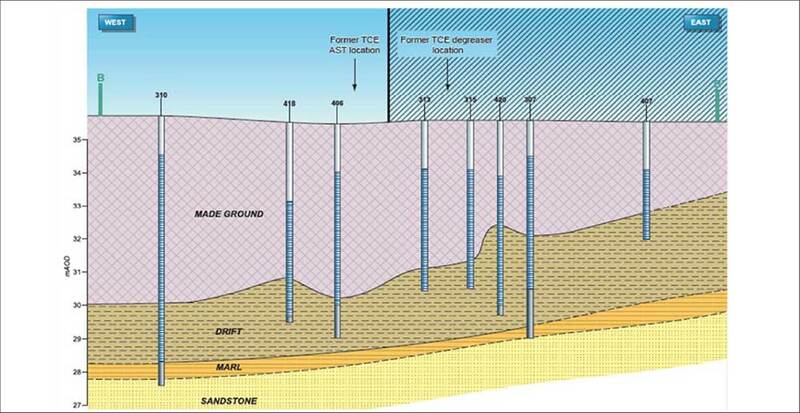 Due to the diminishing returns of contaminant recovery the scheme was decommissioned and AECOM subsequently worked with REGENESIS to provide a follow-on in situ treatment of the residual contamination in groundwater. 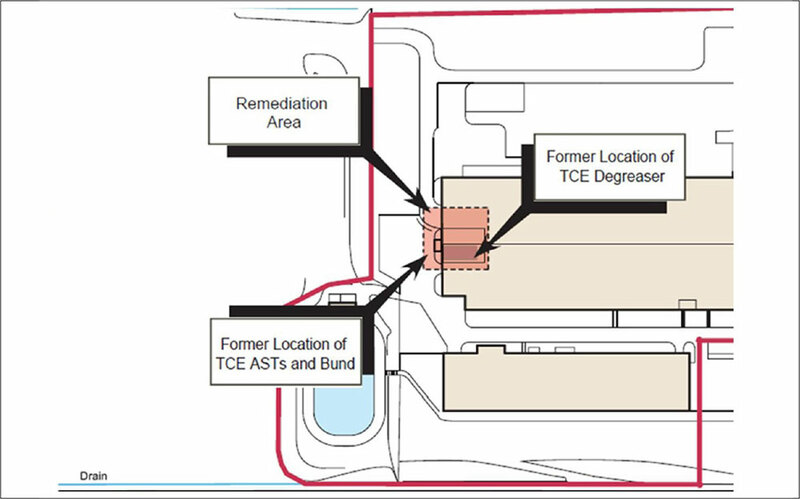 REGENESIS and AECOM devised a remedial design based on the updated Conceptual Site Model (see figure 4). 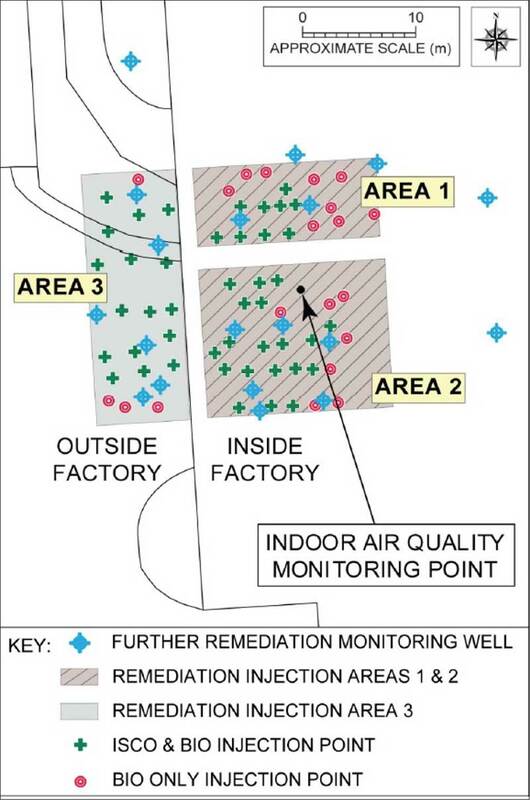 After the DPE phase, two thirds of the contaminated area required in-situ treatment inside the factory (See figure 4). In Situ Chemical Oxidation using Regenox® injected over three campaigns at approx. 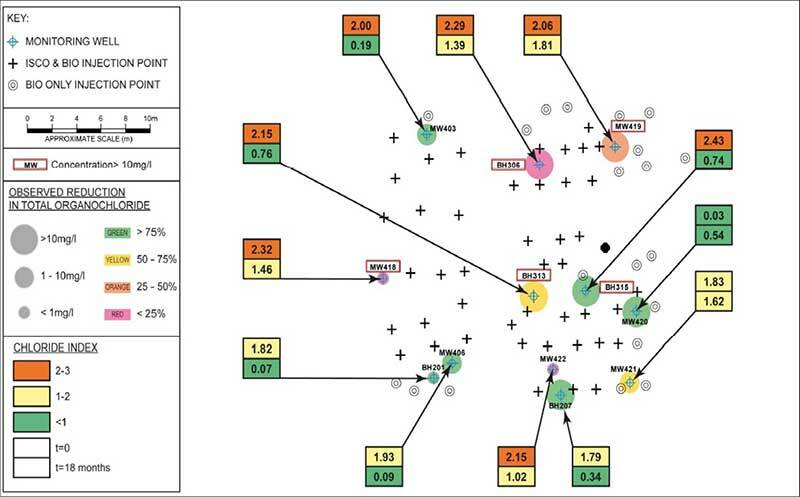 44 locations within the residual source zone in a period of 3 months. The intention of the treatment was to provide mass reduction of the contaminant loading. This was followed by application of HRC®, which was injected at a further 20 locations. The HRC provided Enhanced Reductive Dechlorination of the residual dissolved phase CHCs and intermediates for the following 24 months. Significant contaminant mass removal occurred following mobilisation into the aqueous phase as a result of the RegenOx treatment, and whilst potential localised DNAPL remained, after 18 months following the HRC treatment, the Chloride Index (a molar-based means of identifying the relative degree of reductive dechlorination) averaged 0.9 compared to 1.9 prior to treatment, demonstrating that Enhanced Natural Attenuation was addressing the residual dissolved phase contamination. The site remained operational throughout the indoor and outdoor treatment. The injections were timed around production activities, avoiding potential conflicts. ISCO using RegenOx was able to rapidly reduce the mass loading at the site prior to ERD of the residual dissolved phase. After 18 months monitoring, no further action was agreed with the Regulator.